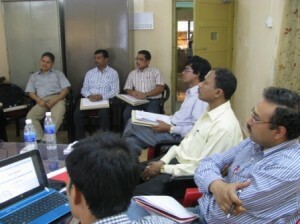 The 1st meeting of Committee was held on 21st March, 2013. The Director of Research and scientists of the University; Deputy Director of Agriculture (Admin), Malda; Assistant Director of Agriculture (Plant Protection) of Malda and Uttar Dinajpur; Assistant Director of Agriculture (Fertilizer) of Dakshin Dinajpur were present. The action plan for Kharif 2013-14 was revised. 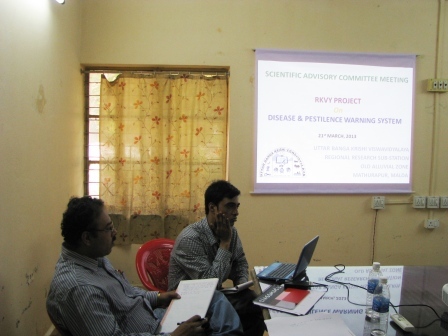 Target crops along with target pests and diseases were selected based on regional importance. Methodology for data collection, communication and processing as well as delivery of the advisory protocol to the farmers were also decided. Programmes on awareness creation among the farmers was discussed ( Proceedings – PDF Download).